The myth of community water fluoridation causing attention deficit hyperactivity disorder (ADHD) is just not supported by the data. I show this in a new paper accepted for publication in the British Dental Journal. This should remove any validity for the claims about ADHD by anti-fluoride campaigners. Mind you, I do not expect them to stop making those claims. Perrott, K. W. (2017). Fluoridation and attention hyperactivity disorder – a critique of Malin and Till. British Dental Journal. In press. Malin, A. J., & Till, C. (2015). Exposure to fluoridated water and attention deficit hyperactivity disorder prevalence among children and adolescents in the United States: an ecological association. Environmental Health, 14. It was quickly taken up and promoted by anti-fluoride campaigners – becoming one of their most cited papers when claiming harmful psychological effects from fluoridation. Part of the reason for its popularity is that it is the only published paper reporting an association between community water fluoridation (CWF) incidence and the prevalence of a psychological deficit. All other reports on this used by anti-fluoride campaigners are based on studies made in high fluoride regions like China where fluorosis is endemic. Those studies are just not relevant to CWF. While many critics rejected Malin & Till’s conclusions on the simple basis that correlation does not mean causation I decided to look a bit deeper and test their statistical analyses. This was easy because they used published US data for each US state and such data is available for many factors. I posted my original findings in the article ADHD linked to elevation not fluoridation. This showed that a number of factors were independently associated with ADHD prevalence (eg., home ownership, poverty, educational attainment, personal income, and % of the population older than 65) and these associations were just as significant statistically as the association reported by Malin & Till. However, multiple regression of possible modifying factors showed no statistically significant of ADHD prevalence with CWF incidence when mean state elevation was included. Huber, R. S., Kim, T.-S., Kim, N., Kuykendall, M. D., Sherwood, S. N., Renshaw, P. F., & Kondo, D. G. (2015). Association Between Altitude and Regional Variation of ADHD in Youth. Journal of Attention Disorders. Huber et al., (2015) did not include CWF incidence in their analyses. I have done this with the new paper in the British Dental Journal. I firmly believe that scientific journals, like Environmental Health which published the Malin & Till paper, have an ethical obligation to accept critiques of papers they publish (subject to peer review of course). Similarly, it is appropriate that any critique of a published paper is made in the journal where it was originally published. Implicit in this arrangement, of course, is that the authors of the original paper get the chance to respond to any critique and that the response be published by the original journal. My response pointed out the reasons for the time gap (problems related to the journals large publication fee), that no other critique of the Malin & Till paper had yet been published and that any perceived polemics in the draft should normally be attended to by reviewers. This was ignored by Grandjean. Grandjean, P., & Landrigan, P. J. (2014). Neurobehavioural effects of developmental toxicity. Lancet Neurol, 13(March), 330–338. Choi, A. L., Zhang, Y., Sun, G., Bellinger, D., Wang, K., Yang, X. J., … Grandjean, P. (2015). 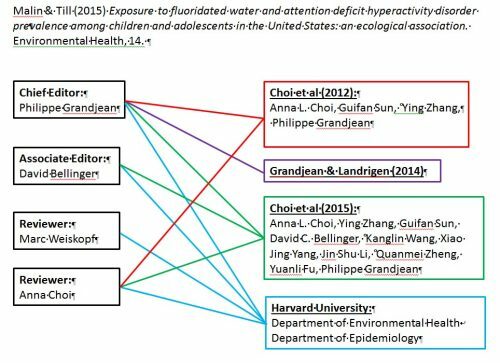 Association of lifetime exposure to fluoride and cognitive functions in Chinese children: A pilot study. Neurotoxicology and Teratology, 47, 96–101. Grandjean is part of the research group that has published data on IQ deficits in areas of endemic fluorosis – studies central to the anti-fluoride activist claims that CWF damages IQ. He also often appears in news reports supporting research findings that are apparently critical of CWF so has an anti-fluoridation public standing. In my posts Poor peer-review – a case study and Poor peer review – and its consequences I showed how the peer review of the original Malin & Till paper was one-sided and inadequate. I also provided a diagram (see below) showing the relationship of Grandjean as Chief Editor of the Journal, and the reviewers as proponents of chemical toxicity mechanisms of IQ deficits. So, I guess a lesson learned. But the unethical nature of Grandjean’s response did surprise me. I then submitted to paper to the British Dental Journal. It was peer-reviewed, revised and here we are. This basically repeated the contents of my article ADHD linked to elevation not fluoridation. However, I tried to use Malin &Till’s paper as an example of problems in ecological or correlation studies. In particular the inadequate consideration of possible risk-modifying factors. Malin & Till clearly had a bias against CWF which they confirmed by limiting the choice of covariates that might show them wrong. I agree that a geographic factor like altitude may not have been obvious to them but their discussion showed a bias towards chemical toxicity mechanisms – even though other social factors are often considered to be implicated in ADHD prevalence. Of course, anti-fluoride campaigners latched on to the papers of Peckham et al., (2015) and Malin & Till (2015) to “prove” fluoridation was harmful. I guess such biased use of the scientific literature simply to be expected from political activists. However, I also believe the scientific literature contains many other examples where inadequate statistical analyses in ecological studies have been used to argue for associations which may not be real. Such papers are easily adopted by activists who are arguing for or against specific social policies or social attitudes. For example, online articles about religion will sometimes refer to published correlations of religiosity with IQ, educational level or scoio-economic status. Commenters simply select the studies which confirm the bias they are arguing for. These sort of ecological or correlations studies can be useful for developing hypotheses for future study but it is wrong to use them to support an argument and worse as “proof” of an argument. Be very wary of ecological or correlation studies.Correlation is not evidence for causation and many of these sudues iognore other possible important risk-modifying factors.